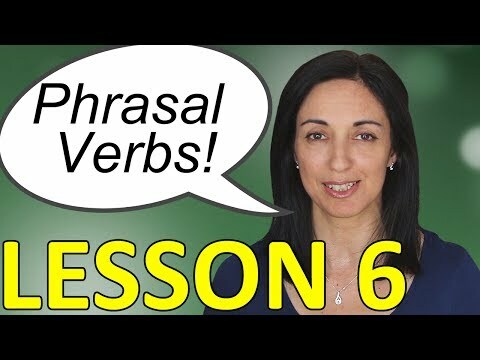 This is the sixth lesson in our series 'Phrasal Verbs in English Conversation'. You will first listen to and repeat a dialogue with examples of phrasal expressions, and then practise these in a gap filling exercise. Lesson 1: http://youtu.be/WHwxdtT302I Lesson 2:http://youtu.be/YKjOdwHXL6A Lesson 3: http://youtu.be/He_98tB6WUg Lesson 4: http://youtu.be/90CxBxnKqtw Lesson 5: http://youtu.be/-gGqhGaV5Lk To learn more about phrasal verbs, visit our website: http://anglo-link.com Facebook: http://facebook.com/AngloLink Twitter: http://twitter.com/AngloLink Enjoy and good luck with your English studies!